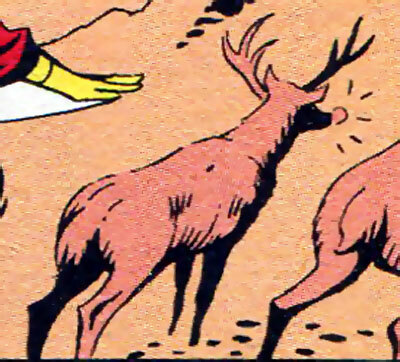 That’s right, not only did Firestorm The Nuclear Man vol I #4 feature the introduction of the Hyena, it also featured a cameo by Rudolph the Red-Nosed Reindeer! Clearly either penciller Al Milgrom or inker Jack Abel were having some fun with this issue! My thanks to that whippersnapper, Chad Bokelman, for sending this my way! He sent me this info back in March and I’ve been waiting all this time to post it! Thanks Lil’ Chad! Support Firestorm (and Rudolph in the Reindeer Games)! Fan the flame! Posted in: Al Milgrom, Comic books, Firestorm #01: Original (Ronnie/Martin), Firestorm comic vol. I. ← JLA film based upon a story featuring Firestorm? Those young’ns have good eyes.